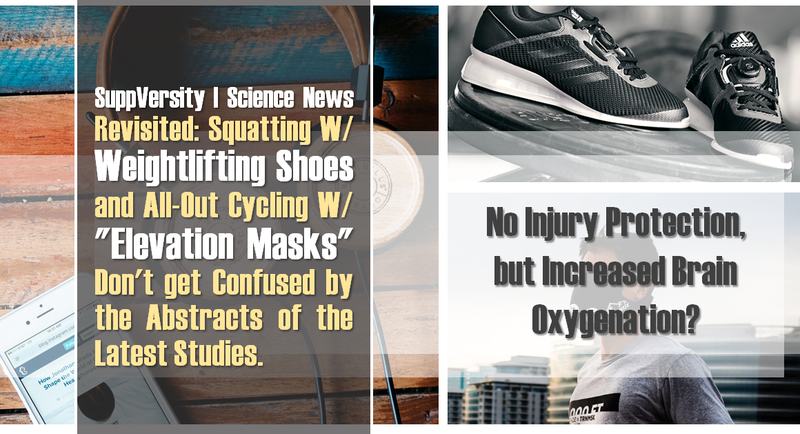 Weight lifting shoes don’t make a difference and “elevation masks” (those things that simply impair your ability to breath) work… they increase your cerebral oxygenation – don’t rely on the potentially misleading abstracts, alone… read SuppVersity! BFR, Detraining & Kettlebells – Will They Help? Tapering 101 – Learn How It’s Done! You will probably remember my confusingly controversial article about weightlifting shoes from November 2017. Some of you almost seemed to be offended by objective data… data that was albeit not in line with your bias towards the “super stable” and “muscle activation promoting” shoes. Long story short, I am curious what you will make of Lee’s latest study. As Lee et al. point out, Adidas, Reebok and other shoe companies claim “that weightlifting shoes with a raised heel may lead to a more upright trunk posture, and thus reduce the risk of back injuries during a barbell back squat” (Lee 2019). Figure 1: Illustration of the kinematic measures from previous studies; here Sato et al. (2012). What do we know about the heel-effect? A number of published research studies assessed the effects of the heel-raised foot posture on the trunk and lower extremity biomechanics during execution of the barbell back squat. In that, the results of studies like Sato et al. (16) or Legg et al. (11) are probably the most cited investigations; and what shall I say? 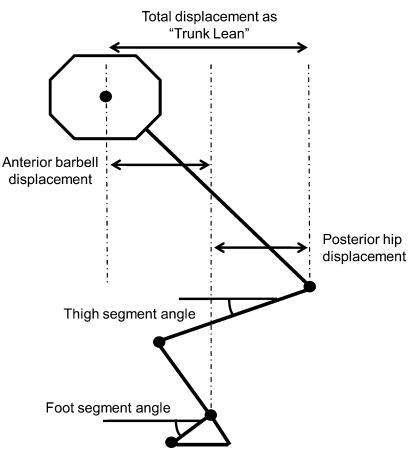 Both “found less relative displacement between the hip and the bar in the weightlifting shoes condition, indicating a less flexed trunk posture” (Lee 2019). As Lee et al. point out, though, Legg’s conclusion that “wearing Olympic weightlifting shoes may aid those with back pain because of the decreased trunk flexion causing less strain on the spine” (Lee 2019)… So far so good, another claim, namely an increase knee extensors and reduction of spinal extensor activity was postulated but not measured by the UK researchers (Legg 2017). And Lee et al. highlight other “limitations” in the introduction to their latest paper in the Journal of Strength and Conditioning Research: First, the investigators tracked trunk movement as represented by the relative motion between the bar and the hip/pelvis. This type of method does not directly capture the angular displacements of the thoracic and lumbar spine segments. Second, nonstandardized running and athletic shoes were used in previous studies, which are variable by style and may differ in stiffness. […] Third, the weight the subjects lifted during some of the studies was relatively low (unloaded to 60% of the subjects’ 1 repetition maximum (1-RM)), meaning that the results cannot be extrapolated to more challenging efforts commonly used in training for recreational weight lifters” (Lee 2019). Figure 2: Photos of foot placement from all three conditions (A-C), photo of the shoes that were used (VS Athletics). at 80% of their 1 repetition maximum. Surface electromyography was used to assess the activation of the knee extensors and paraspinal muscles at L3 and T12 spinal levels. “[…] none of the heel-raised foot postures significantly affected trunk and lower extremity muscle activation (thoracolumbar paraspinal [p = 0.52], lumbar paraspinal [p = 0.179], knee extensor [p = 0.507]) or the trunk angles (thoracolumbar spine [p = 0.348], lumbar spine [p = 0.283]) during the squat” (Lee 2019). This result obviously implies that “during barbell back squats, heel-raised foot postures do not significantly affect spinal and knee extensor muscle activations, and trunk and knee kinematics”; and yes, that also means that “heel-raised weightlifting shoes are unlikely to provide significant protection against back injuries for recreational weight lifters during the barbell back squat” and hence “recommendations of heel-raised footwear for performing the barbell back squat cannot be made on the basis of back injury prevention” (Lee 2019). “Full Squat for Full Size Gains, Partial Squat for Full Strength” | read more. We have to be careful, though, after all, the study doesn’t refute another often-cited benefit of squatting w/ heels, i.e. their ability to facilitate ankle mobility to achieve the desired squat depth and increase foot-floor stability in non-recreational weightlifters where the depth of squat is an important criterion – not the least, because previous studies have implicated its role in making optimal gains (see SV Classic “Full Squat for Full Size Gains, Partial Squat for Full Strength Benefits” | read more). Oxygenation Responses While Wearing the Elevation Training Mask During an Incremental Cycling Test (Romero-Arenas 2018) – Absolutely what everyone would have predicted! The masks are no alternative for altitude training – that’s quite certain. “Wait, so the study at hand is not ‘actually relevant’?” Why’s that? While it does make sense to probe the “oxygenation responses while wearing the elevation training mask during an incremental cycling test”, the results of the study at hand tell us absolutely nothing about the efficacy of regular use of the tested training mask, the “Elevation Training Mask 2.0” (ETM) – and, as you know, te often-claimed benefits “have not been conclusively demonstrated” (Romero-Arenas 2018) by previous research. Figure 3: Brain and muscle oxygenation kinetics during the incremental cycling test during the CTR (open circles) and ETM (black circles) conditions (Romero-Arenas 2018). So why discuss the results, then? Well, both the primary (brain oxygenation) as well as the secondary outcomes, which included heart rate (HR) response, perception of effort (rating of perceived exertion [RPE]), arterial oxygen saturation (SaO2), blood lactate (La+), and performance (POpeak), are interesting and worth discussing. Don’t freak out about a potentially increased stroke risk… yet! Unless you have pre-established asaccular cerebral aneurysms, the major risk factor for subarachnoid hemorrhage and strokes, the mask is – just like the ValsaÃ¶va Maneuver – likely pretty safe. Speaking of Valsalva, if you want to learn more about that, check out this 2013 article at Starting Strength. As the abstract already tells us, the study from the Catholic University of Murcia involved fourteen active males who completed an incremental cycling test to volitional exhaustion in 2 separate and counterbalanced conditions, wearing the mask set at 9,000 feet (i.e., 2743 m) and a control condition (CTR, without ETM). To assess the oxygenation of the blood “during the trial, muscle and cerebral oxygenation were monitored continuously using near-infrared spectroscopy” (Romero-Arenas 2018 | check out Figure 1, too). “[T]he mask caused an increase in brain oxygenation compared with the CTR condition (p < 0.05)” (Romero-Arenas 2018). In conclusion, while the most relevant parameters that would suggest that RTMs can increase the efficacy of your training (HI(I)T) sessions were not improved from suffocating yourself, the “increase in O2Hb and tHb in the frontoparietal cortex without any change in the muscle oxygenation” (Romero-Arenas 2018) is both counter-intuitive and unexpected. Keep in mind, though: The increase in cerebral blood flow (i.e., higher tHb levels) possibly being “related to an increased intracranial pressure, which, in turn, is a major risk condition for cerebral autoregulation” (Romero-Arenas 2018). Therefore, what may look as a great benefit initially does, after all, constitute yet another potentially “life or death”-argument (see red box) against the use of ETMs – ah,… and yes, the fact that the study at hand confirms that “ETM does seem to negatively influence cycling performance (i.e., peak power output), which may attenuate training outcomes over time” (Romero-Arenas 2018) doesn’t really make this funky gym gimmick more attractive to anyone but elevation mask producers, either. If you want to use NaHCO3 to improve your performance but cannot stomach it, try to “serial load” it | learn how that works. Bottom line: It’s always good to stay open-minded and listen to both, research & practice (esp. what your own body tells you about using weightlifting shoes ;-). In that, the elevation training mask study clearly shows, though, that, at least, the former needs careful interpretation – I mean, if I had chosen to title “elevation mask increases brain blood oxygenation” that would have been an absolutely evidence-based statement, of which many (if not the majority of people) would have been misled to believe that my previously voiced concerns about the use(less! )ness of respiratory training masks would, at least, have taken a hit; when, in fact, the results Romero-Arenas et al. present in their ahead-of-print article in the Journal of Strength and Conditioning Research provide yet another reason not to bank on “looking like Bane” when you’re at the gym –unless, obviously, you’re doing it to stick out… as a critically uncritical victim of bro-science 😉 | Comment! Lee, S-P, Gillis, CB, Ibarra, JJ, Oldroyd, DF, and Zane, RS. Heel-raised foot posture does not affect trunk and lower extremity biomechanics during a barbell back squat in recreational weight lifters. J Strength Cond Res 33(3): 606â614, 2019. Legg HS, Glaister M, Cleather DJ, Goodwin JE. 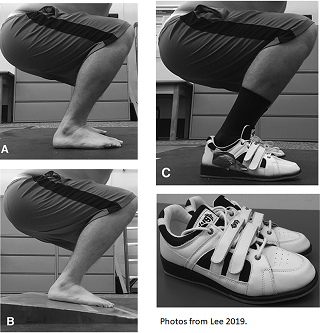 The effect of weightlifting shoes on the kinetics and kinematics of the back squat. Journal of Sports Sciences 4;35(5):508-15, 2017. Molinari, Filippo, et al. “Relationship between oxygen supply and cerebral blood flow assessed by transcranial Doppler and nearâinfrared spectroscopy in healthy subjects during breathâholding.” Journal of neuroengineering and rehabilitation 3.1 (2006): 16.